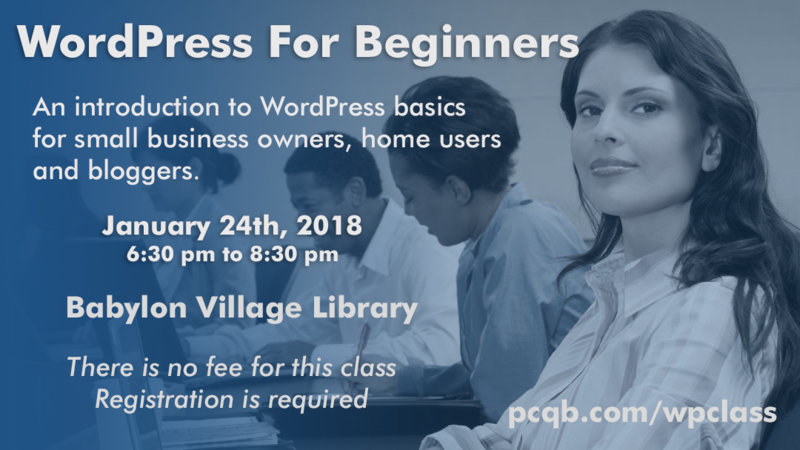 PCQB , in cooperation with the Babylon Village Library, Will be teaching a basic WordPress class/workshop on January 24th, 2018 from 6:30 pm to 8:30 pm. WordPress For Beginners will serve as an introduction to using the WordPress content management system for a business or personal website. This is a beginner’s class and no prior knowledge is required. If you’ve been thinking about taking the plunge into WordPress, or you have an existing site that you’d like to learn how to manage, this is the perfect first step. Topics covered in this class will include an overview of WordPress itself and how it works as well as its advantages and disadvantages. We will also discuss WordPress.com vs WordPress.org, what you’ll need to get started, how to set up your site and get it online and how to navigate the complex ecosystem of WordPress themes and plugins. In addition, there will also be a brief demonstration of how to log in and navigate the WordPress back end, make posts and create pages. There is no fee for this class, but registration is required.